I’ve created a new addon to bring some better debugging tools to the text editor in Blender. This should make writing scripts in Blender much easier! nice functionality, i wonder if you can route the blender console messages in it? Good Spirit Graphics has released an update to the ‘BreakPoint’ ‘addon’ for ‘Blender.’ The most important new feature is the ability to print your variable values to a log file inside your .blend file. This allows you to use the ‘Find’ function, in the ‘Text Editor’ window, to search for specific conditions. 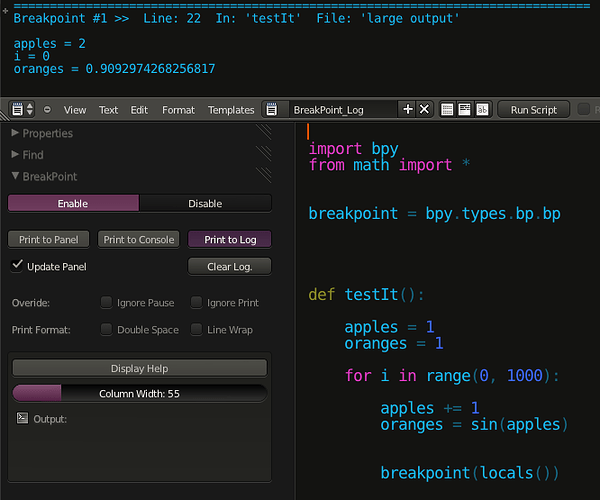 It took a while but I finally made it to the text editor and I have been meaning to check put this debugger.